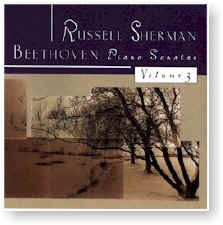 Volume 3 is the widely anticipated new installment in Russell Sherman's bold and controversial vision of the Beethoven Piano Sonatas. [All thirty-two sonatas are being recorded and released by GM Recordings as five double-CD sets.] Over the past two years, Volume 1 (GM 2050) and Volume 2 (GM 2053) have generated enormous amounts of press, controversy and praise, being selected along the way as Stereo Review’s ‘Pick of the Month’ and one of the Boston Globe’s Top Ten Classical Releases of the Year in 1996 and 1997. Sherman began his studies at the age of six, and by the age of eleven, was studying with the renowned Eduard Steuermann, friend of Ferruccio Busoni and Arnold Schoenberg. A child prodigy from New York, Sherman graduated from Columbia University in Humanities at the age of fifteen and soon thereafter played solo piano with Leonard Bernstein's orchestra. Featured on National Public Radio, he has earned a reputation over the years as an interpreter of remarkable insight and imagination both in standard piano repertory and in his vigorous advocacy of contemporary music. Recorded on 17-20 December 1995 (Sonatas 2, 6, 12, 15 and 27) at the Campion Center in Weston, Massachusetts, and 15 April 1997 (Sonata 23) at the Church of the Redeemer in Chestnut Hill, Massachusetts.